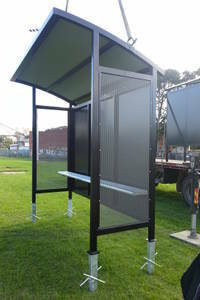 Abel Sports have recently installed removal interchange benches for the City of Yarra Council at Fairfield Park. Vic. The sports ground is used for soccer in winter, and in summer the benches will be removed to maintain the open park look required for the cricket season. The benches do not require cement slabs and are installed in steel ground tubes, that allow the benches to be lifted and removed to be stored in the Council Depot. The ground tubes are buried beneath the surface and well camouflaged when the benches are removed. The attached photo shows the interchange bench prior to being installed into the ground tubes. David Vesely Abel’s General Manager said that it has been difficult to keep up with the demand for Abel coaches boxes this season and suggests orders be placed early for the 2014 football season.